Brief Description U-Pick apple orchard,farm market and agrioursim venue. Description U-pick apple orchard, farm market, bakery and festival venue featuring many agritourism activities for families in the fall. While the market is open every day in Sept., Oct. and Nov. the u-pick festivals are only on the weekends of Sept. and Oct. Bring all the children and watch them have the time of their life. 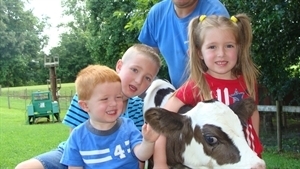 They can milk a real cow, ride the cow train, jump on the jumping pillow, play mini golf, ride the wagon through the orchard, visit the Apple Museum, Moonshine Museum or the Farmhouse Museum. You don't want to miss our famous pig races with swimming pigs. We have a very unique hands on petting farm with baby farm animals. After you've worked up an appetite visit the food court for burgers, hotdogs, pizza, BBQ or some of our great fair food such as roasted corn, chicken on a stick, funnel cakes, fried oreos or boiled peanuts. Sit back and enjoy your food while you watch Bluegrass Bands or clogging groups perform on the stage. As you leave through the farm market be sure to take some of our sweet treats from the bakery home with you. We have fried apple pies, doughnuts, and fritters made right here. You can even get them hot in the ice cream parlor. For a fun day in the fall there's no better place to visit than Hillcrest Orchards. Family owned and operated since 1946. Add Hillcrest Orchards and the Apple Pickin' Jubilee to your free online travel itinerary.